HRC today announced its endorsement of Hillary Clinton for President. HRC’s Board of Directors, comprised of 32 community leaders from across the nation, unanimously voted to endorse Secretary Clinton -- an endorsement she will accept next Sunday, January 24 at an event in Des Moines, Iowa with HRC President Chad Griffin and the organization’s members and supporters. Today’s endorsement comes at a time when the stakes could not be higher for the LGBT community. Over the last seven years under President Obama’s leadership, the nation has made substantial progress on LGBT equality -- from the end of “Don’t Ask, Don’t Tell,” to his Executive Order protecting LGBT employees of federal contractors from discrimination, to his historic support for nationwide marriage equality, to signing landmark hate crimes legislation, speaking out against so-called “conversion therapy,” and working to protect LGBT students. Despite the fact that a majority of Republican and Independent voters today support federal protections for LGBT Americans, the leading Republican candidates for president have threatened to halt progress as well as revoke, repeal, and overturn the gains made during President Obama’s two terms. HRC President Chad Griffin said, “All the progress we have made as a nation on LGBT equality -- and all the progress we have yet to make -- is at stake in November. In most states, LGBT people are still at risk of being fired, evicted or denied services simply because of who they are. Today, 63 percent of LGBT Americans report having experienced such discrimination, and we are seeing other troubling trends, from the onslaught of state and local anti-LGBT measures to the national scourge of anti-transgender violence to backsliding on HIV/AIDS prevention and youth homelessness. Against this backdrop, we’ve heard the leading Republican presidential candidates repeatedly threaten to block our progress, and to revoke, repeal, and overturn the gains we’ve made during President Obama’s two terms. WATCH: The Human Rights Campaign has released a new video on today’s endorsement. The Human Rights Campaign -- with 1.5 million members and supporters nationwide -- is planning an unprecedented organizational effort to register and mobilize the nation’s pro-equality majority and elect pro-LGBT candidates up and down the ballot. In 2016, HRC expects that the pro-equality vote will be larger, stronger, and more energized than at any point in history. Exit polls show that in 2012 at least six million LGB Americans voted in an election decided by less than five million votes. Today, in key states like Ohio, North Carolina, and Florida, the population of LGBT adults is greater than the average margin of victory in the last three presidential elections. HRC has begun organizing members and supporters in Iowa, New Hampshire and South Carolina ahead of the upcoming caucus and primary elections. HRC will soon make announcements about campaign activities related to Presidential, Senate and other races in additional states. Beyond the LGBT vote, polling has shown that in 2016, LGBT equality could be a pivotal issue for the general electorate. Support for marriage equality hit a record high of 60 percent over the last year, and nearly 80 percent of Americans support federal non-discrimination protections for LGBT people. LGBT equality is also a key decision point for voters: a 55 percent majority of Americans say they would be less likely to vote for a candidate opposed to marriage equality. This progress has been driven in great part by the growing number of Americans -- now nine out of ten people -- with an LGBT person in their lives. 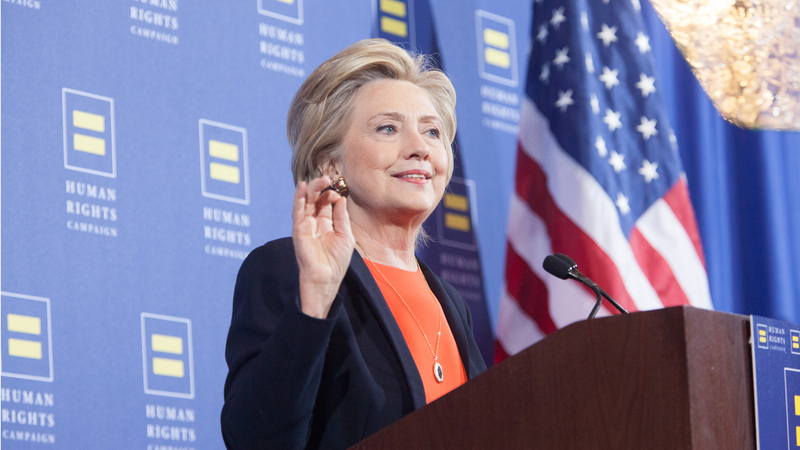 Secretary Clinton has made LGBT equality a pillar of her campaign and recently unveiled the most robust and ambitious LGBT plan any candidate for president has ever laid out. She has vowed to fight for the Equality Act -- a bill that would finally offer explicit, clear, and permanent non-discrimination protections for LGBT people at the federal level -- and her detailed LGBT policy platform specifically calls for dropping the ban on open transgender military service, outlawing dangerous “conversion therapy” for minors, ending the epidemic of transgender violence, and supporting HIV prevention and affordable treatment, among other proposals that would advance equality and support the LGBT community. Clinton also has a long record as a champion for LGBT rights both in the U.S. and, notably, around the globe. As Secretary of State, Clinton became the first in her position to robustly advocate for LGBT equality throughout the world, making a historic and forceful speech to the United Nations declaring that “gay rights are human rights.” In the Senate, she helped lead on bills to protect LGBT workers from employment discrimination, and had a strong record on key votes and legislation that mattered to LGBT Americans. HRC’s endorsement criteria include support for issues of concern to the community, demonstrated leadership on LGBT issues, and viability. As part of that process, all candidates -- on both sides of the aisle -- were asked to fill out a candidate questionnaire. Secretary Clinton, Senator Bernie Sanders, and Governor Martin O’Malley provided answers, while no Republican candidates for president returned HRC’s questionnaire. HRC has, however, compiled a detailed look at each of the Republican candidates’ records and those assessments can be found here. HRC endorsed Barack Obama for president in June 2008 and in May 2011, Senator John Kerry for president in June 2004, and Al Gore for president in February 2000. Paid for by Human Rights Campaign PAC. Not authorized by any candidate or candidate’s committee.